Doctors have discovered that the cause of a 16-year-old's mysterious vomiting illness is a grill brush bristle that he accidentally ate. Tristin Beck of Mountlake Terrace, Wash. thought he had bad stomach cramps or a virus when he couldn't stop throwing up, The Seattle Times reported. His mother said that doctors at Seattle Children's Hospital ran "about a million tests" and conjectured it could be anything from a brain tumor to a birth defect. It wasn't until exploratory surgery last Sunday night to look for a possible bowel obstruction that surgeons found a bristle about the size of a short hair strand inside Beck's small intestine. He had been eating grilled chicken at a BBQ two weeks prior to his illness. "Somehow one of the tiny little hairlike wires got stuck in one of the grills in the barbecue and in a one-in-a-million chance it got stuck in a piece of chicken that I ate and made it most of the way through my body but then got stuck in my intestines and basically started stabbing me from the inside out," Beck told The Seattle Times. Beck is expected to make a full recovery. Although the case may seem surprising, this isn't the first time swallowing part of the grilling tool has lead to negative health consequences. The Centers for Disease Control and Prevention (CDC) wrote in the July 2012 issue of Morbidity and Mortality Weekly Report that medical professionals should be on the look out for wire grill-cleaning brush brisles. Six cases were reported at Providence, R.I., hospital alone between March 2011 and 2012. All the patients, five of whom were men, had been grilling meat before they ingested the wire. Injuries included a puncture in the neck tissue to a perforated gastrointestinal tract. The same hospital also reported six more cases between July 2009 through November 2010. Another Washington man needed surgery last July after swallowing a steel bristle. He initially went to the emergency room because of abdominal pain. Park of the problem is that the bristles are small, so people don't notice if they eat them. They're also difficult to spot on X-rays and scans. 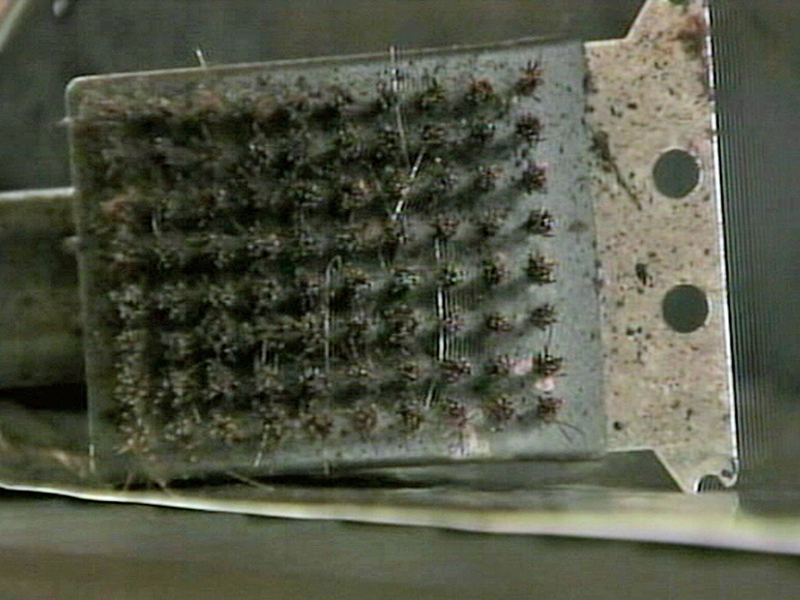 Dr. Robert Glatter, an emergency medicine physician at Lenox Hill Hospital in New York City, previously told CBSNews.com that while accidentally consuming a grill brush bristle is unlikely, it is still possible. Using a moist cloth or paper towel to clean the grill before cooking may be a better option, he pointed out. "It is important to carefully inspect the grill surface for any remaining wire bristles that may have separated from the grill brush and could penetrate into the grilled food prior to grilling," Glatter said.